When arranging content on slides, you can toggle several alignment features on and off in PowerPoint 2011 for Mac. 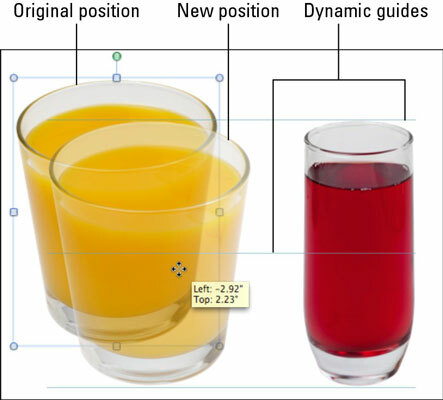 These features are designed to help you place objects in alignment with each other or to an invisible grid on a slide. Toggle Rulers on and off by choosing View→Ruler on the menu bar or by right-clicking in the slide area (but not on an object) and choosing Ruler from the contextual menu. When nothing is selected, a line in each ruler indicates the current cursor position. When an object is selected, its position is shown in the ruler. Dynamic Guides: When these guides are turned on, as you drag objects slowly on your slide, guide lines will automatically appear when the selection border of the object you are dragging is perfectly aligned with another object on the slide. Static Guides: Turn these on to display a blue horizontal line and vertical line — the static guides. After positioning an object, drag the static guides to match the position of the object. The guides stay put so you can align other objects along the same line. Snap to Grid: When toggled on, this option causes objects to automatically align to an invisible grid as you drag them slowly. When toggled on, as you drag an object it will move in small increments rather than smoothly. a.Drag an object to a position that’s close to being aligned with another object on the slide. If Dynamic Guides are also on, the Dynamic Guides appear a little sooner than when Snap to Shape is turned off. b.When you see a Dynamic Guide, you can let go of the mouse, and the object you’re dragging aligns itself to the other object. It might feel as if the Dynamic Guide is pulling the object you’re dragging away from your control. The Snap to Shape option is subtle, but it could have just enough effect to make life easier when aligning shapes to each other.